Last week we baby-sat for our friends 1.5 year old son and it was amazing. I didn’t get home from work until 7:30pm and my husband was already home baby-sitting. He is so proud of himself that he changed his first poopy diaper ever. =P As soon as I walked in the door, I went from super stressed and “flip my sh**” mode into “yay we have a baby in the house!” mode. Anyone knows me, knows that I have baby fever, and I have it BAD. That being said, we are *not* trying to have a child yet, as we know we just are not ready to start a family. We are still too selfish and too much in debt and have too much to work on within ourselves before we can bring new life into the world. That being said, we do plan to start the trying-to-get-pregnant process within the next year, we just need to get a bit more squared away first. But it was really encouraging that I instantly got into mommy-mindset when I got home from a really awful day. Granted, I don’t have to come home to a kid every single night, and I just might change my mind once I have my own running around, but at least for now, it was a saving grace. 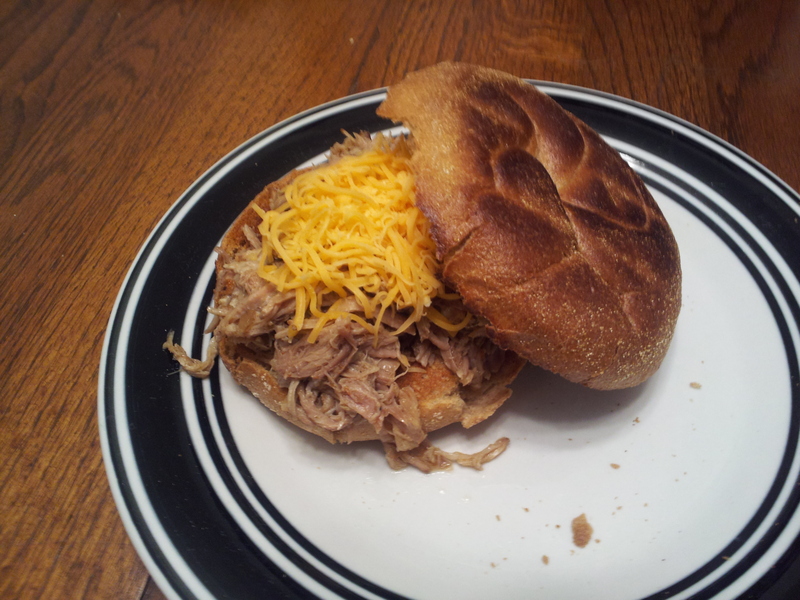 The same night that we baby-sat, there was cajun pulled pork brewing in the crock pot. I was so proud of my husand (in addition to changing the poopy diaper), because I didn’t have time to throw everything in the pot before leaving for work, so I asked him to. I gave him step-by-step instructions on what to do as I was flying around the apartment finishing getting ready, until he finally said, “Whitney, I know how to read directions!” And he did a great job. That being said, this was not the best pulled pork in the world, I must be honest. Also, it was my first time using liquid smoke, but I feel like I have to use it on its own to truly figure out the flavour and what it adds to a dish. I’m pretty sure it’s the water that negatively affected this dish. It was more dry than hearty. And let me be clear, I love pulled pork. Here are some other pulled pork dishes I have made: barbecue pulled pork (which is the same blogger as this cajun dish) and regular pulled pork sandwiches. However, it did make a ton of leftovers, which provided a ton of lunches. -Put the meat into a large plastic zipper bag with brown sugar and all spices. Seal well and shake to coat. Then pour contents of bag into the crock pot. If the meat is too big for the bag, then just put it into the crock and rub the seasoning all over it (I’m actually not sure what my husband did on this one). -Top with chopped onion, butter, and liquid smoke, then pour in water. -Cover and cook on low for 8-10 hours, or until meat shreds easily with a fork.